When Amy Somers loses her job as a lobbyist, she moves to Misty Willow, well aware that she's crossing bridges she'd burned years before. With all the mistakes she's made and the uncaring things she's done--even to her own family--she can hardly believe that happiness will find her, especially when Gabe Kendall, her first crush and her first kiss, rides back into her life atop a buckskin mare. A former Marine, Gabe is at loose ends after serving a prison sentence for being in the wrong place at the wrong time. He sees beyond Amy's hard exterior to the girl he once knew and loved, and he longs to see her open her heart. Yet with his vision clouded by shame for his past and fears about the future, he finds it difficult to see the path ahead. 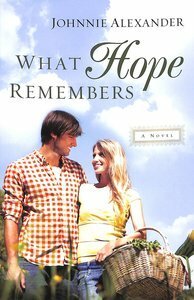 About "What Hope Remembers (#03 in Misty Willow Series)"
Johnnie Alexander is the award-winning author of "Where Treasure Hides" and "Where She Belongs". Johnnie is an accomplished essayist and poet whose work has appeared in the "Guideposts" anthology "A Cup of Christmas Cheer". In addition to writing, she enjoys reading, spending time with her grandchildren, and taking road trips. She lives near Memphis, Tennessee.